Grace: I thought you were a doctor. The Doctor: I thought you were a doctor. The human race is locked in deadly combat with the 'Android Hordes' in the Orion System. Light years from the front line, the Doctor and Charley arrive to sample the dubious delights of a galactic backwater, little suspecting that the consequences of the Orion War might reach them there. But High Command's list for victory knows no bounds. 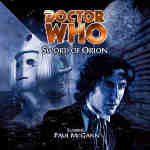 Trapped aboard a mysterious, derelict star destroyer, the Doctor and Charley find themselves facing summary execution. But this is only the beginning of their troubles. The real danger has yet to awaken.